North Korea may have hit its own city with a missile test gone horribly wrong. Satellite imagery shows extensive damage to a building in Tokchon shortly after Kim Jong-un launched a Hwasong-12 ballistic missile, it has been reported. Photos seen exclusively by The Diplomat show there was no such damage to the buildings before the test on April 28. It suggests the 25-tonne rocket, most likely launched from the nearby Pukchang Airfield, flew out of control and hit the city which is home to around 200,000. A US government source told the site the rocket failed one minute after it was launched and came crashing down "causing considerable damage to a complex of industrial or agricultural buildings". GoogleEarth images from 2016 show no such damage to the buildings, one of which does not appear to have been built yet. The unnamed source said the missile may have been destined to go down in the Sea of Japan, near the Russian coast, where its first Hwasong-12 test rocket landed in May 2017. Kim announced his reclusive nation had become a "full nuclear state" in November following the successful launch of his most powerful rocket. It flew 600 miles at an altitude of 2,780 miles before crashing into Japanese waters. 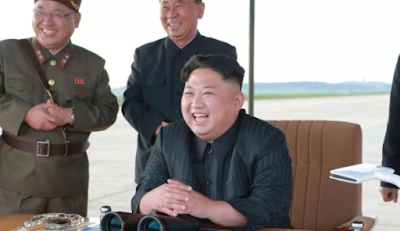 NASA scientist Dr David Baker warned Kim could spark World War 3 by accidentally hitting a neighbouring country with his "imprecise" missiles. » Man who wanted to blow up girlfriend after getting her pregnant accidentally blows himself up too.